Star Wars Celebration begins today, so look for a ton of stuff to pop up over the new four days. Many companies were setting up their displays. JediNews.co.uk was able to snap shots of some of the figure displays. They reveal that the Star Wars Black Series line will be gaining some red accents on the packaging. Jedi Temple Archives has posted a few detailed images. They show upcoming Star Wars Black Series 3.75″ Figures carded from the display. After the jump, you can see photos of the Black Series 3.75″ and 6″ figures display. 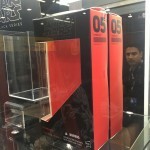 These include close ups of the new 6″ scale packaging for Chewbacca. Be sure to check out the JediNews.co.uk Instagram for more pre-show pics. Lots of new Star Wars Black Series figures went on display at San Diego Comic-Con 2014.